Protects your car's roof from scratching during travel, cushions the load and prevents slipping of car top carrier during travel. Cushions the load and protects the roof finish. The Optional RoofBag Protective Mat is strongly recommended for cars without a roof rack and recommended for cars with a roof rack. Without the Protective Mat, wind and car vibration coupled with dirt that collects between the roof and the carrier, can scratch the roof's finish. This special non-slip soft rubbery webbing goes between your car's roof and your RoofBag roof top cargo carrier, providing extra padding and preventing scratching of the car's finish. Made of woven polyester fabric coated with a special high-friction poly-vinyl compound. This Mat provides superb gripping power that protects your car's roof finish. The RoofBag Mat is tear resistant, flame retardant and treated to inhibit mold and mildew. - Goes between RoofBag car top carrier and car’s roof. - Protects the roof’s paint from scratching during travel. - Strongly recommended for cars without a roof rack, since they don't have protective ribs on the roof. 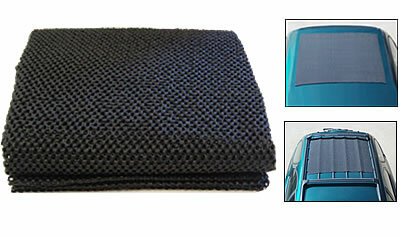 - Can also be used on cars with a roof rack, to protect the paint between the roof's protective ribs. - Prevents slipping or sliding of the carrier during travel. - Provides extra padding, helping cushion the load to protect the roof. - Made of a special thick, rubbery, non-slip webbing material.